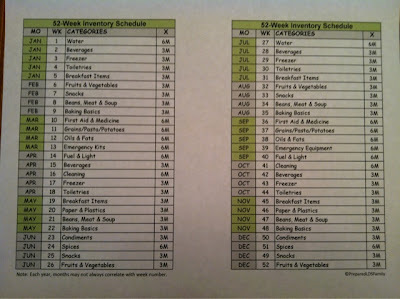 Counting my food storage used to be so time consuming until I came up with a 52-Week Food Storage Inventory Schedule. After studying how various restaurants take their inventories, it became clear to me that they don't count food once a year like many of us do. Food has to be managed regularly and carefully in order to keep it safe for human consumption. There is much to be learned from the restaurant industry because they are the guys trying to stay in business by being the most cost effective and safe. And we should be careful too. It used to take me 3 or 4 hours to count my food storage. But now I count a small amount of it in 15 minutes or less each week. Of course that will be easier for some than others, depending on how many items you have and how organized your shelves are. 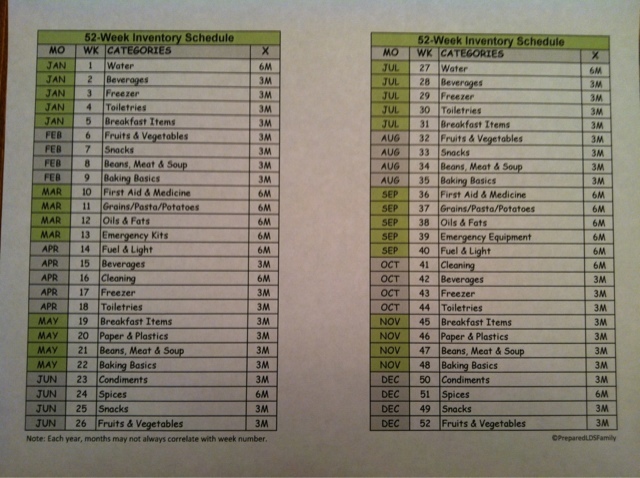 So, I designed a 52-Week Food Storage Inventory schedule that has me counting a category of items weekly. Some items are counted every 3 months, 6 months or 12 months. For example, you might count Fuel & Light items every 6 months, but Breakfast & Snack items every 3 months. You may get behind taking an inventory each week because life gets busy. When I was out of town for nine days, I counted two categories this week: Water and Paper & Plastic. Life is unpredictable, but it wasn't difficult to count both areas. I enjoy straightening the items, throwing away a few boxes and bags, and seeing what more is needed. 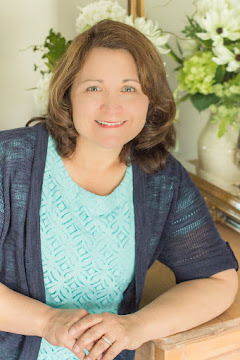 As I'm looking, I write down a few items I might want to buy during my next Costco shopping trip (toilet paper, paper plates, storage bags, and dish detergent). Note: Each year, the months may not always correlate with the week number. You are just an amazingly organized person with your food storage. I always look forward to your blog updates and enjoy all the "goodies" you have prepared for us to help get our food storage on track. I think the hardest part is actually having a plan and getting started. Your lists make the planning part so much easier. Thank you for sharing this--and all your other stuff! It looks very helpful. This is so helpful. I always read your emails first. I can't wait to see your food storage room decorating ideas. I have two huge gorilla shelves in our guest room and have considered converting my home office to share with food storage shelves. I have justed started working on food storage the last month or so, although I have had a fairly well-stocked pantry before that. My question on inventory is coming from the perspective that I'm also trying to simplify and cut out a lot of chemicals. What is the logic of the paper products on the list? I revamped the list with the things I use to make my cleaners, but want to understand the thoughts behind all of the paper plates and bowls and plasticware before deciding not to store it. Hi Goinggreenmon, Having a supply of paper goods and plastic will help you during a disaster. Imagine being without water to wash your dishes, cups or containers. I also include foil in my paper and plastic category as well, which is excellent for emergency cooking. So if you don't use those items everyday, consider what you will use for emergencies. Hope that helps you understand. It does make sense in a short term situation I suppose, but not in a long term one in my mind. Sort of a mindset issue of, at what point do I start going to the creek close to my house to get water if power is not in service to pump water. You can also keep your inventory list on Google Drive or evernote & access it while shopping or anywhere from your smartphone or tablet.